Behavioral tests and serum cytokines levels in ICU patients. 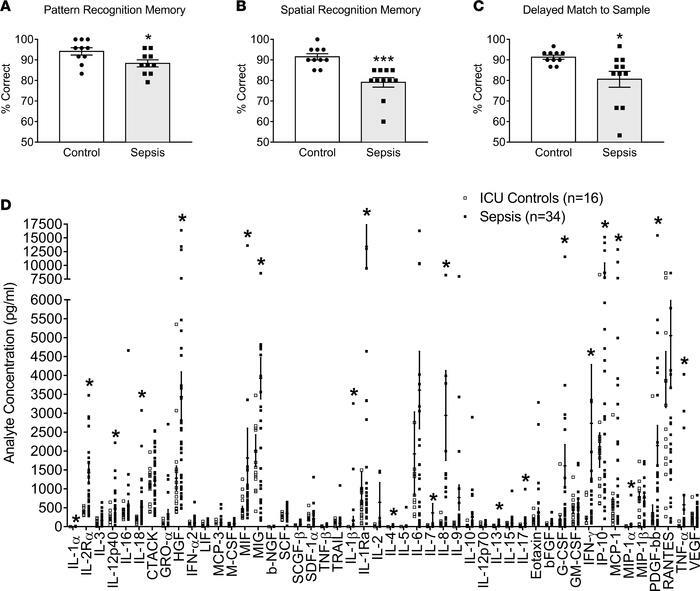 ICU sepsis survivors were evaluated at 12 months after hospital discharge in (A) pattern recognition memory (control n = 10, sepsis n = 11), (B) spatial recognition memory (control n = 10, sepsis n = 10), and (C) delayed match to sample (control n = 10, sepsis n = 11). Data represent mean ± SEM. *P < 0.05, ***P < 0.001 vs. controls, unpaired 2-tailed t test. (D) The level of blood cytokines was determined at 24 hours after hospital admission in ICU controls (n = 16) and septic patients (n = 34). Data represent mean ± SEM. *P < 0.05 vs. ICU controls, Mann-Whitney U test.